When it comes to hot tub repair, the best maintenance is proactive. Frequently checking your filters, chemical levels, cover, and control panel are all ways to keep your spa running at its best for longer. Even with dedicated and routine maintenance, though, spas are subject to repair needs depending on variables such as weather, season, age, and model of the hot tub. Below are the five signs that indicate you should schedule spa service sooner rather than later. The smell of strong cleaning chemicals is one thing, but any odor that seems stomach-turning might signal a real problem with your hot tub. Strong, bad smells could point to a water contaminant, such as nitrogen or pesticides. This would make your hot tub unusable and would signal the need for immediate spa repair. Another reason for the bad odor might be clogged filters, drains, or pumps. If these gateways are filled with material, it means the water in your hot tub isn’t properly circulating and thus not getting cleaned. To ensure that your hot tub is clean and safe for use, you should definitely schedule hot tub repair. It can be hard to tell if your hot tub is actually leaking since water often splashes from the spa, but a tell-tale sign is if it is leaking from the bottom or side. Leaks can be really hard to find, as they can involve nearly any part of the hot tub, from the pumps to the heater. Leaks can also be tiny, but this doesn’t mean they don’t signal the need for prompt hot tub maintenance. If you let a leak go without repair, they can get bigger and ultimately keep your hot tub from filling up all the way. If your water is green or black, chances are it’s not just a food coloring mishap. Instead, discolored or cloudy water usually signals algae growth, chemical imbalance, or equipment erosion. If it’s just a simple chemical imbalance, then properly adding chemicals to get a pH between 7.4 and 7.6 will do the trick. Similarly, using an algaecide might solve the problem if the algae hasn’t spread too far into the hot tub equipment. Regarding equipment erosion, you could try a scale and stain hot tub cleaning product. 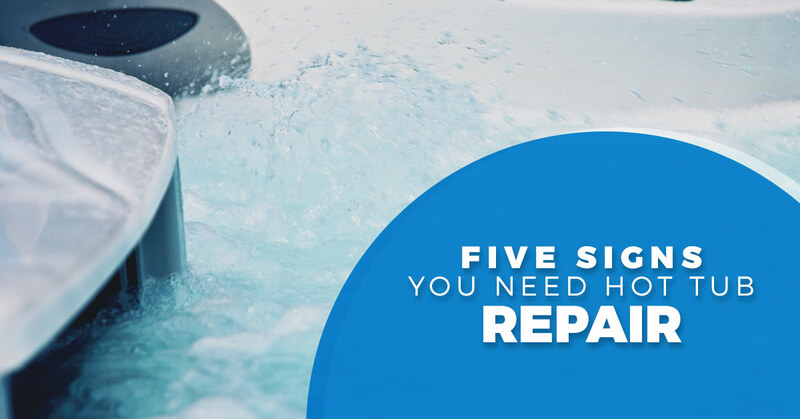 However, if any of these problems continue, you should schedule hot tub repair to ensure that the inside of your hot tub is clear and the problem isn’t more serious. The reason you bought a hot tub is so that it can indeed be hot. There’s nothing worse than looking forward to a dip in the spa, and then realizing that the water temperature hasn’t budged from 80 degrees. If your hot tub isn’t heating at all or can’t maintain a proper water temperature, then it’s a sign that you should schedule spa repair. Usually, this signals a problem with the heater or control panel – either the heater isn’t working and can’t raise the temperature, or the control panel can’t send the temperature signal to the heater. Either way, this can be a complicated repair, so it’s best to set up hot tub maintenance. When your hot tub jets don’t work at all or produce a weak stream, there could be multiple issues with your hot tub. Easy fixes include making sure the jets aren’t clogged, the water level is high enough for the jets to work, and the bottom drain cover isn’t covered. Your spa jets not working could also point to more complicated problems with the pumps, valves, and control panel. If simple unclogging doesn’t work, you should look to spa maintenance to get your hot tub up and running again at full speed. A good rule of thumb to follow is that if something seems off with your spa, it probably is. For easy fixes, check all of your drains and jets to make sure they’re not clogged. Using a cover is also a great preventative measure to make sure outside toxins and debris don’t get into your spa and cause damage. If you’re experiencing a bad odor, leak, discolored water, cold water, or jet issue, it’s probably a sign that you should set up hot tub repair. We are a family run business and take pride in serving the Northern Colorado area. We do not have high pressure commissioned sales people and insure that we treat each customer like they are part of our family!